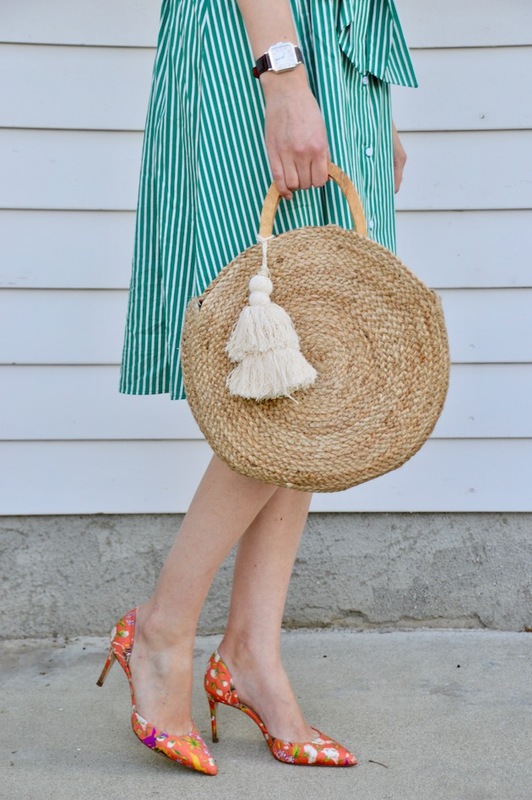 Since I am wearing all green in this look, not to mention orange shoes evoking the flag of Ireland, I am going to count this is my belated Saint Patrick's Day post! Although I didn't wear this outfit for Saint Patrick's Day, I did wear it the week of the holiday, so I guess it kinds of counts. I actually wore a kid's T-shirt with Hello Kitty sitting by a rainbow and a pot of gold yesterday to celebrate. Truth be told, I didn't do anything particularly exciting to celebrate Saint Patrick's Day, save for making a grocery store run for some Guinness and eating corned beef and cabbage with family for dinner, so wearing a T-shirt and jeans turned out to be the perfect outfit for the occasion. 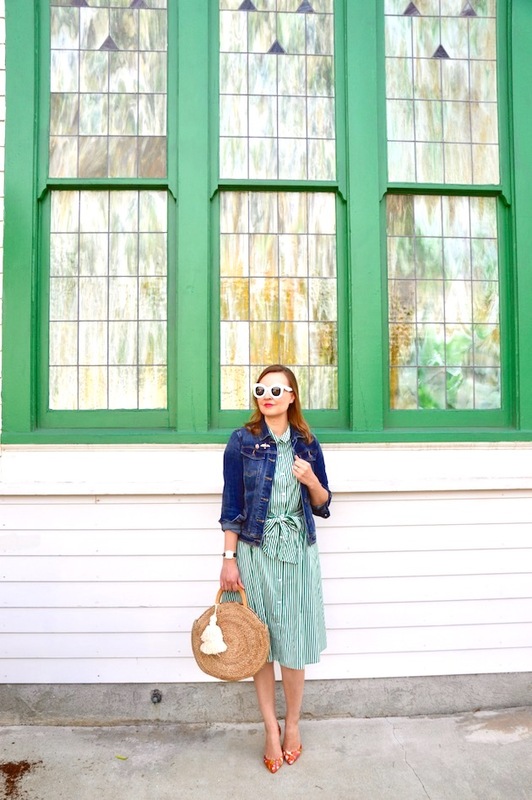 Keeping with the theme of green, this outfit, especially the dress, did not cost a lot of "green". 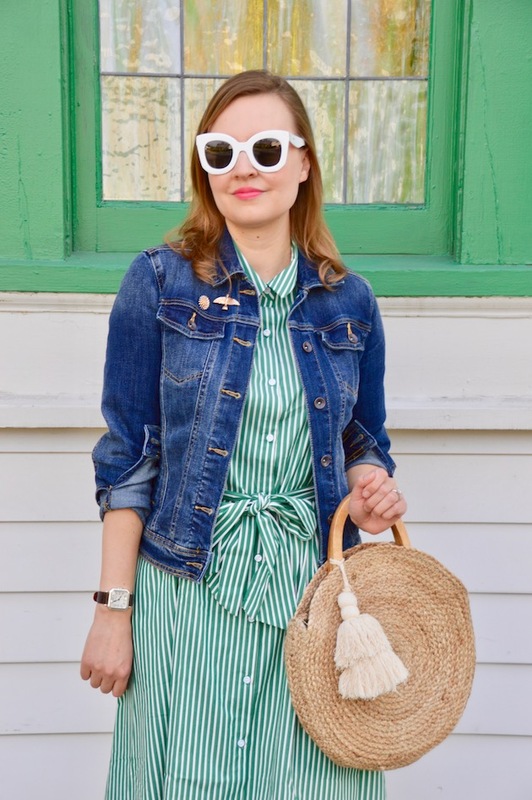 In fact, the green and white striped shirtdress I am wearing is from Forever 21 and was under $25. 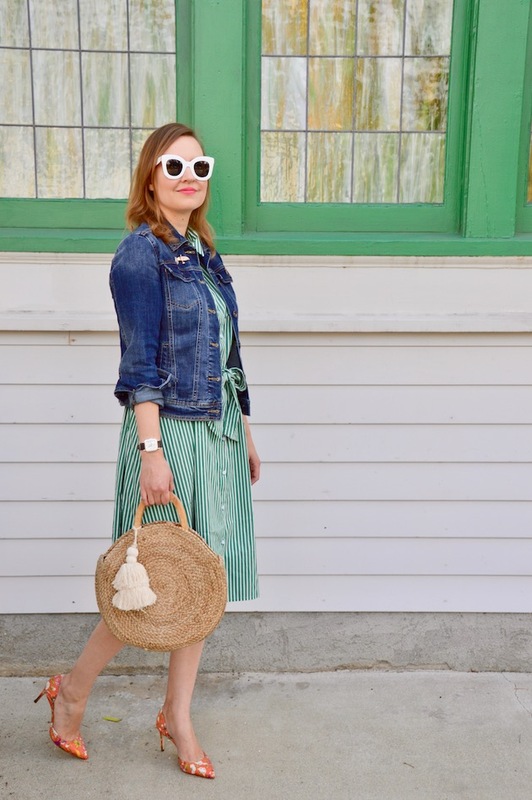 Forever 21 is really doing a fantastic job with many of the things that they are featuring for spring this season. Part of me is starting to think that I might be getting too old for the Forever 21 brand (I know, this coming from a woman who just mentioned she sometimes shops in the kid's department! 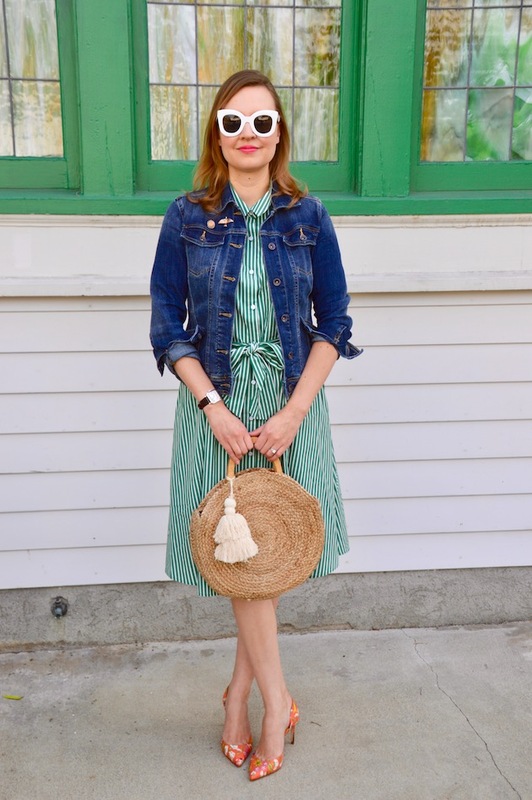 ), but as long as they continue coming out with styles like this that can be worn by women of all ages, I don't mind spending the green at their store! Well I love the green dress. It's so cute and bright for spring! 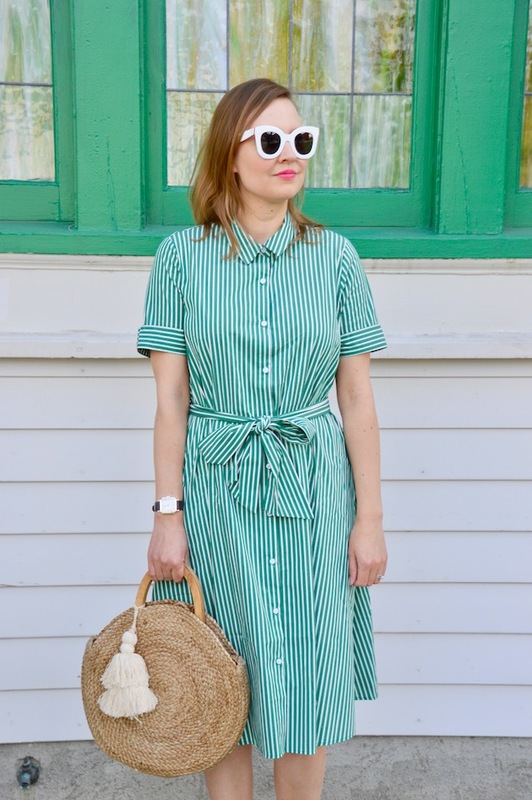 I love striped summer dresses, this one is so perfect! 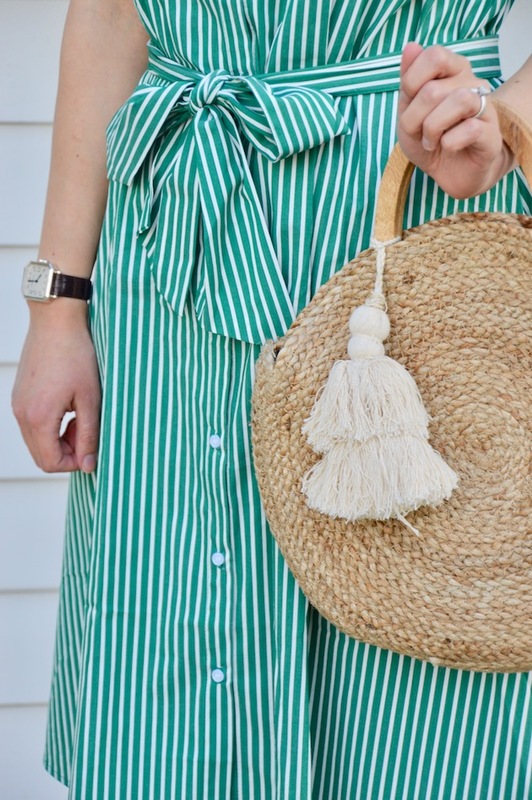 Your straw bag has got me too, if only I could justify another straw bag! Okay...could you be any cuter?? I love everything about this, in fact, I may have to copy it!!! Would that be creepy? ?